Roasted cauliflower, havarti cheese, apple, and curried mayo slapped between two slices of bread and melted to perfection. Who says you need meat to make a sandwich? This sandwich is a little weird, guys. It’s based off a sandwich I had at a local restaurant one day. My office mates and I went out for lunch to celebrate a coworker’s birthday, and somehow I ended up ordering this totally wackadoo-sounding combination of roasted cauliflower, thinly sliced apple, melty cheese, and a curried mayo, all between slices of wheat bread. And somehow it immediately became my new favorite sandwich. 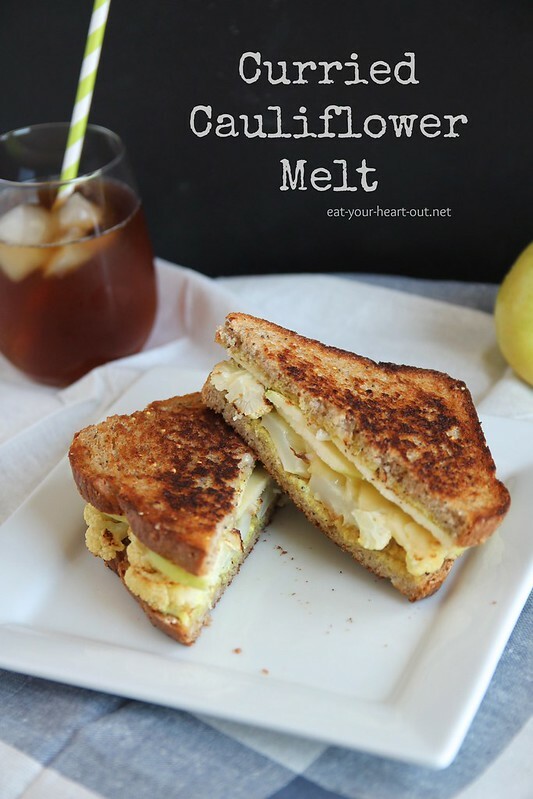 I am sharing this Curried Cauliflower Melt recipe over on The Law Student’s Wife today while Erin and her hubby spend the month of June galavanting through France. It may not be a baguette (which Erin has been eating plenty of), but trust me – you need this crazy little sandwich in your life. Oh please. I LOVE cauliflower and grilled cheese sandos, so my heart pretty much explooooded when I read the title of your post. Funny how sometimes the strangest sounding foods can be absolutely amazing. Love this. Need the whole bit! Again. This is why we are soulmates. So glad you found this sandwich and took the time to recreate it. Can’t wait to try it. Thank you, Karen! Hope you love it! Saw this link on Twitter and just had to visit. Sounds delish!